Like tiny cars, space-age toilet seats and energy-efficient kerosene room heaters, dryers that run on 110 volts are common in Japan and scarce in North America. Actually, the electrical standard in Japan is 100 volts, but that's essentially equivalent to the voltages commonly cited as the North American standard – 110, 115 and 120 volts – which are all basically the same. The 110-volt dryer may not be common in North America, but it exists, and you can buy a 110V dryer at Lowe's or any big-box store. This type of dryer is small enough for a single person to carry, and depending on the model, you can usually attach it to a rack and mount it on the wall. That sounds super convenient, and there's more – you'll also save energy. The Japanese people may have a great selection of small consumer appliances, but they don't have the option of larger ones that run on 220-volt power (which, for the record, is the same as 230-, 240- and 250-volt power). One advantage of the higher voltage is that it reduces the amount of current needed to achieve a particular amount of electrical power. Power is equal to current times voltage, so if you double the voltage, you can cut the current in half to achieve the same amount of power. Instead of reducing current draw on 220-volt appliances to save energy, though, North American manufacturers increase it. The average current draw of a typical 110-volt dryer is 15 amps, whereas that of a 220-volt dryer is usually 30 amps. The net result of the extra power consumption is that the dryer elements provide more heat and clothes dry quicker. The blower motor in a 220-volt dryer is also more powerful than the motor in a 110-volt dryer, and there's more space for air to circulate, which are two more features that contribute to faster drying. If you live alone, or you live in a super-small apartment, you don't need the extra power of a 220-volt dryer. The smaller 110-volt dryer is more manageable. It fits into small spaces, and it can handle small loads of up to 7 pounds in about an hour at high heat. It draws 15 amps, so that represents a power consumption of about 1.6 kilowatts, which is what a 220-volt, 30A dryer draws in about 15 minutes. 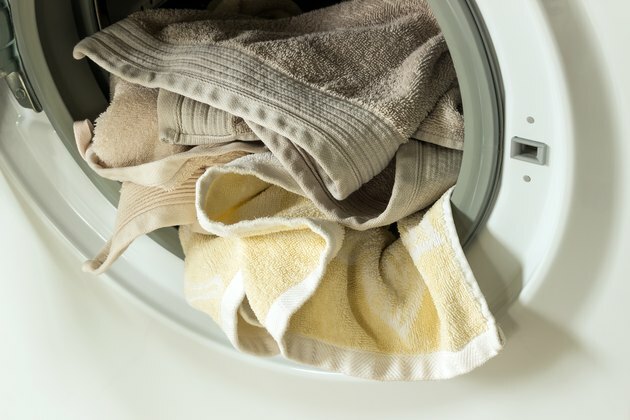 If you have a family, and you need to double the load to 14 pounds, you'll have to run the dryer for more than 3 hours at high heat to get your clothes dry. That consumes almost 5 kilowatts, which is still less than the power consumed by a 220-volt, 30A dryer running for an hour at full power. Can I Swap Out My 220-Volt Dryer for a 110-Volt Dryer? A 110-volt dryer plugs into any standard three-prong residential 120-volt outlet. If you want to put one in the laundry room and use the same plug that powers your current dryer, you can convert a dryer plug to 120V by using an adapter. Plug it in, and it will convert your 220V dryer plug to 110V (or 120V), providing a standard three-prong NEMA 5-15P outlet for you to plug in the new lower-voltage dryer. If you need more drying power than a 110V electric dryer can provide, but you don't have a 220V outlet, consider a gas dryer. The blower and tumbler run on 110V power, and you plug the unit into a 110V outlet, but the heat comes from the combustion of natural gas or propane. How Many Watts Does a 5,000-BTU Air Conditioner Use?